I purchased the cutest Halloween wall hanging pattern created by Kimberbell. It was offered at The Missouri Star Quilting Company who turned it into a block of the month tutorial. You can see the tutorials on You Tube and follow Jenny as she creates each block. Well, once I got started, I couldn't stop. My neighbor loves Halloween, too, so I made two of these at the same time and was finished with both in about a week. 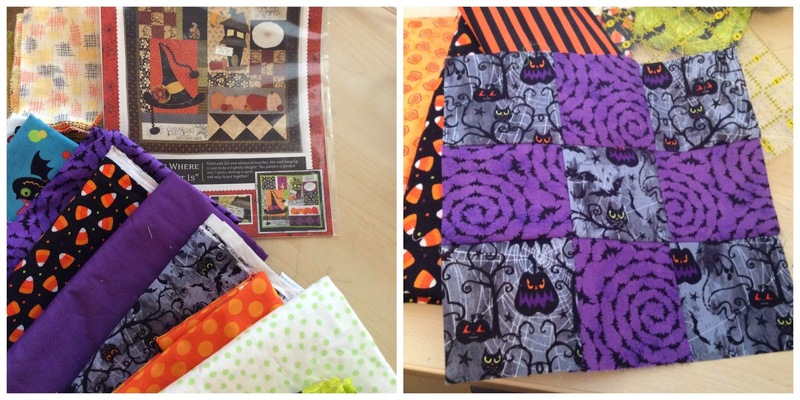 I think half the fun was collecting the Halloween fabric for the different blocks. The blocks in this little quilt are on the small side so I didn't need a lot of yardage, just variety. The 3-D embellishments added to the finished blocks are great. The spider has yarn legs, the hat gets a jaunty flower, and the broom gets a batch of bristles. There are some embellishments I choose not to add, like the pumpkin patch yoyos and a sign next to the haunted house. I made them, but when it came time to add them I just wasn't happy with the effect. This was a quick and fun project. As I was making it, I thought of several other blocks that could be added to make a full-size quilt, or maybe just another wall hanging. Hmmm . . .